RCS Electrical Services is your generator installation service repair maintenance expert. From 10Kw to 1000Kw contact us for all your generator needs. We are certified to do Generac generator installation, Guardian generator installation, Centurion generator installation, Kohler generator installation, Briggs and Stratton generator installation, General Electric generator installation, and others. We also specialize in Guardian generator repair, Generac generator repair, Centurion generator repair, Kohler generator repair, Briggs and Stratton generator repair, General Electric generator repair, and many other brands of generator repair. Contact us now if you are in need of generator service, generator maintenance, generator installation, or generator repair. 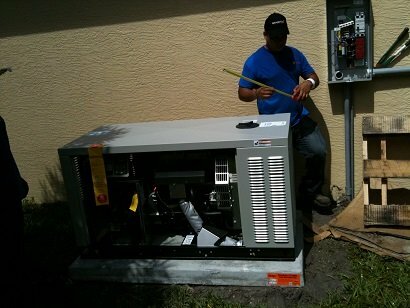 RCS Electrical Services offers a complete solution for your generator installation. We handle the entire project, so that you have peace of mind in the knowledge that you have a single point of contact for all questions and concerns. When you ask us to do your project, you can be assured that we don't take the fact that you chose us lightly. We will work for you employing the best techniques, materials, parts and equipment so that your installation has the quality you and your family deserve and expect from your Lantana generator installation professional.